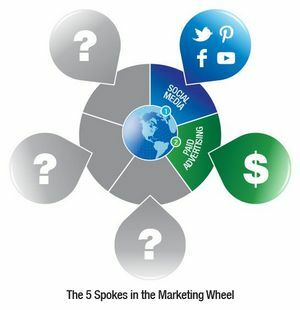 Marketing is much like a wheel in the sense that your website is the “hub”, and all of your other advertising are “spokes” pointing back to that hub. So far, we have looked at Social Media as Spoke #1. Today we will be looking at Spoke #2: Paid Advertising Campaigns. 1. Focus some of the ad’s time on the web address. I know this seems pretty elementary, but I have seen in my days in radio and TV script writers leave a customer’s website out of a spot completely in favor of mentioning a phone number three times. The research is in, and phone number repetition doesn’t help consumers remember your phone number…it makes them shut the commercial off when they hear it start the second time. Nobody likes to be beaten over the head with this type of info. You should, in this day and age, spend that same amount of time pushing your website address. When the consumer hears your web address they remember it because it is pertinent to the field that they are in or interested in exploring further. If they are compelled to visit your website that is where you want to present your contact information such as phone # and Social Connections. 2. Tease the website by offering a special in your commercial/print ad that you can only have by visiting the site. Make it worthwhile, and make it grow as the original viewers tell friends and they visit…you can turn a website browser into a full-fledged evangelist for your product by offering a growing incentive to tell more and more people about your site. Require the user to enter an email address or Facebook Like to get a promotion or discount code. 3. Your website must have your industry spelled out in the domain name. If you sell flowers and your businesses name is “Sally’s”, please don’t register www.sallys.com. NO ONE will know what your website is, and Google CERTAINLY isn’t going to know which category to rank your site in. Try www.flowersbysally.com, or www.sallylovesflowers.com. Make it speak to what you are selling, and you will be certain to not miss customers out of confusion. 4. If your website is a point of sale, it should be on everything your logo is on-including all print/Internet/display ads! One thing that most people don’t like is extra work. They don’t want to have to Google you if they can know the address from the beginning. If you are investing in a website advertisement, don’t just link the ad to your site; put the website address in text form on the ad as well. Get your website out to as many people as possible by putting it on business cards, social media sites, print ads and radio/TV ads. Every form of advertising should have your web address. You should also incorporate it in your elevator speech and in any public speaking that you do. Bottom line, if you are going to spend money on advertising, make it easy for those who hear your advertising to spend money with you. Give them a hook/offer, create urgency, and link it back to your website. When they land on your website make sure you are attempting to get additional information from them such as an email address or Social Media connection. This will allow you to connect with them for future advertising campaigns.